Premier League leaders Manchester City visit Crystal Palace on Sunday, looking to equal the longest winning streak in Europe’s top five leagues. Find below our C. Palace vs Man City betting preview with free predictions, betting tips, probable lineups, team news, best odds, exclusive promotions and no deposit free bets on the Premier League! Crystal Palace saw their own eight-game unbeaten streak - their longest one in the top flight - ended by a 3-2 defeat at home to Arsenal on Thursday. They have beaten Watford (2-1) and Leicester (0-3) since mid-December and held Swansea to a 1-1 draw in their last outing before the Arsenal game. They are still only a point outside the bottom three but things have dramatically improved un Roy Hodgson. Anyway, their defense remain their major concern - the Eagles have failed to record a clean sheet in South London this season. Roy Hodgson is unlikely to shuffle his pack for the reception of Premier League leaders. The back four may stay unchanged unless Hodgson considers recalling Timothy Fosu-Mensah in place of Martin Kelly at right-back. In midfield, Yohan Cabaye and Ruben Loftus-Cheek should be fresh enough to retain their starts as they were withdrawn after 53 and 70 minutes respectively last time out. 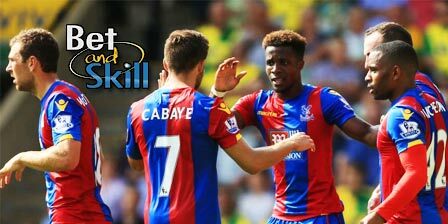 Wilfried Zaha should again partner Christian Benteke in attack, with Bakary Sako providing back-up. Mamadou Sakho, Damien Delaney and Connor Wickham remain sidelined. Manchester City extended their lead at the top of the Premier League to 15 points in midweek after narrowly beating Newcastle 1-0 on the road - their 18th league game in a row. Hence, they mantained their 100% winning record in away games. The success over Newcastle on Boxing Day is only the second away game of the season that the team failed to register under 2 goals. Prior to that match, Man City have bagged five victories in five outings since early December, outclassing Manchester United (1-2), Swansea (0-4), Tottenham (4-1), Leicester City (on penalties after a 1-1 draw in League Cup) and Bournemouth (4-0). The Citizens have claimed 10 triumphs in their last 11 Premier League meetings against Crystal Palace (W10-L1) with the most recent two encounters ending in 5-0 victories for Guardiola's men. Vincent Kompany is unlikely to be available for this clash and will be replaced by Eliaquim Mangala. At left back, Danilo looks set to continue as Fabian Delph is not 100% fit. In midfield, David Silva missed the trip to St James’ Park, and Guardiola is expected to choose Ilkay Gundogan to replace the Spaniard. Leroy Sane only played seven minutes as a substitute on Wednesday night, so he looks poised for a recall on the left of the front three. Gabriel Jesus will push for a start ahead of Sergio Aguero while the in-form Raheem Sterling should retain his starting berth. 18-year-old Phil Foden faces a long spell on the sidelines after injuring ankle ligaments against Leicester City in the Carabao Cup. "Crystal Palace vs Manchester City predictions, betting tips, lineups and odds (Premier League - 31.12.2017)"